Revolutionary design pitchfork with your logo. High quality golf gifts. Pitchfix is a fixture in golf shops and at golf events around the world. Add one to your counter and see the difference. The Hybrid 2.0 is a lightweight switchblade divot tool made from 2 aluminum sheets with great feeling ABS rubberized handles. 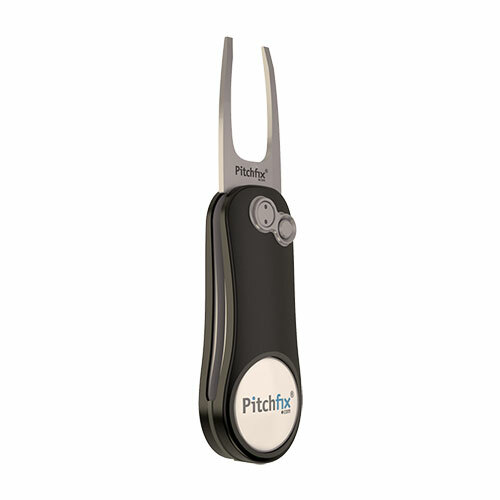 It comes with a personalized removable ball marker with your company or events logo and an integrated pencil sharpener. The name of the product says it all. With the Fusion line we have managed to combine the characteristics of the successful Hybrid line with the award winning pin technology of the Twister 2.0. 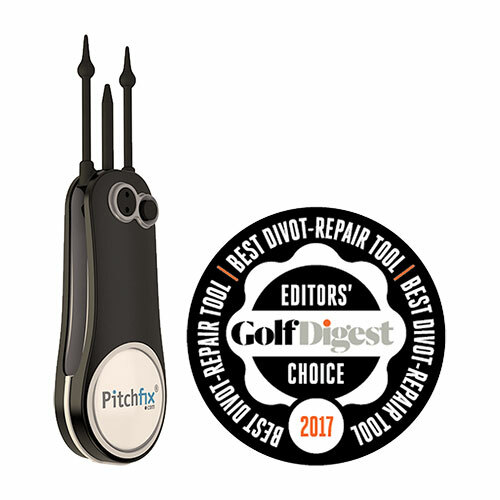 This is without doubt the best divot repair tool Pitchfix has ever produced. We give you the best single prong tool with the award winning pin technology of the Twister 2.0. ABS gun colored handles that are rubberized for the soft touch and grip, white trims, shiny painted colored button trims, black pins and buttons and an integrated pencil sharpener.